The built-in software in Windows 8 easily fetches photos from nearly any make and model of digital camera. It offers more control than earlier Windows versions, letting you group your camera’s photo sessions into different folders, each named after the event. 1Plug the camera’s cable into your computer. Most cameras come with two cables: one that plugs into your TV set for viewing, and another that plugs into your computer. You need to find the one that plugs into your computer for transferring photos. Plug the transfer cable’s small end into your camera, and the larger end into your computer’s USB port, a rectangular-looking hole about 1/2-inch long and 1/4-inch high. USB ports live on the back of the older computers, along the front of newer computers, and along the sides of laptops and tablets. 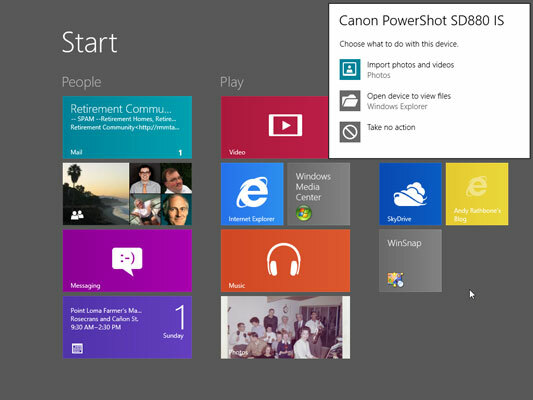 2Turn on your camera (if it’s not already turned on) and wait for Windows 8 to recognize it. Tap the announcement with a finger (on a touchscreen tablet) or click it with a mouse; then move to the next step. 3Choose how to import your photos. The announcement offers three options on how to handle your newly recognized digital camera: Import Photos and Videos, Open Device to View Files, and Take No Action. Windows remembers the choice you make here and repeats it automatically the next time you plug your camera into the computer. 4From the Photos app, choose your options; then click or tap the Import button to import your camera’s photos and videos. The Photos app offers to import all your camera’s photos and videos into a folder named after the current date. If those options meet your needs, click the Import button to begin. Or if you want to pick and choose the photos to import or store them in a differently named folder, the Photos app lets you change these options: Pictures and Folder name. Click or tap the Import button, and the Photos app imports your camera’s photos and videos, placing them into your chosen folder. When the Photos app announces that it’s finished importing the photos, click the announcement box’s Open Album button to see your photos. You’re through. 5Manually copy your photos from the camera to the folders of your choosing. Selecting the Open Device to Choose Files option in Step 3 leaves you at the desktop, staring at an icon representing your camera’s memory card. Double-click the memory card to begin peeking inside its folders. Manually select the photos and videos you want and then copy or move them to the folders of your choice. 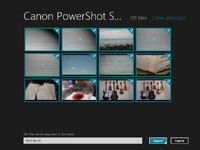 Or for an easier way to import your camera’s photos, move to Step 6. 6Right-click your camera’s icon, click Import Photos and Videos, and choose which way to import your photos. Locate your camera’s icon in the Navigation pane along the folder’s left edge. Right-click the camera’s icon and choose Import Photos and Videos from the pop-up menu. 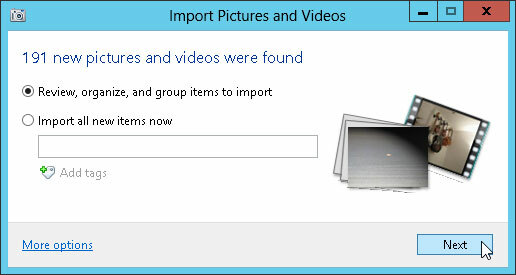 The Import Pictures and Videos dialog box appears. Windows offers two options to match the two different ways people use their camera: Review, Organize, and Group Items to Import and Import All New Items Now. 7Select the Import All New Items Now option, add a short description into the Add Tags box, and click Next. Type a descriptive word into the Add Tags box — Hawaii Trip, for example — and click Next. Windows copies everything into a folder named after the date and the word Hawaii Trip. It also names every file Hawaii 001, Hawaii 002, and so on. You’re done! To see your photos, open your Pictures library and look for your newly named folder. 8Select the Review, Organize, and Group option. Then click Next. 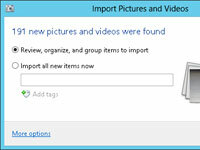 Clicking the words More Options lets you change how Windows 8 imports your photos. It’s worth a look-see because it lets you undo any options you’ve mistakenly chosen when importing your first batch of photos. After you click Next at the Review, Organize, and Group window, Windows examines the time and date you snapped each of your photos. Then, the program tentatively separates your photos into groups for your approval. 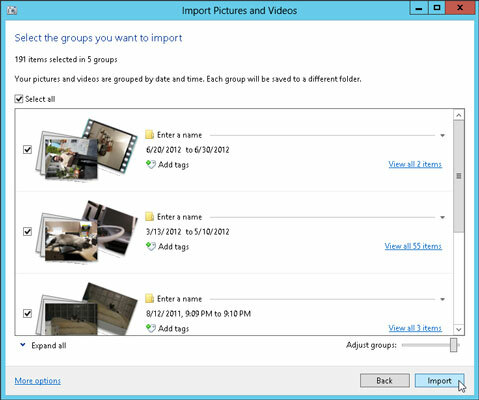 9Approve Windows’ groups, name the groups’ folders, add descriptive tags, and then click the Import button. Name each group by clicking the words Enter a Name and then typing a descriptive title; that becomes the new folder’s name. In the Add Tags area for each group, type in descriptive words about the photo session, separating each word with a semicolon. By tagging your photos, you can easily find them later with the Windows Search program. Don’t like the Windows choice of groups? Then change them by sliding the Adjust Groups bar to the left or right. Slide to the left for lots of small groups, sorted by every half hour you snapped a photo. Keep sliding to the right for fewer groups; slide to the farthest right, and Windows places everything into one group, meaning they all go into one folder. After you’ve named the groups and added tags, click the Import button to finish the job.